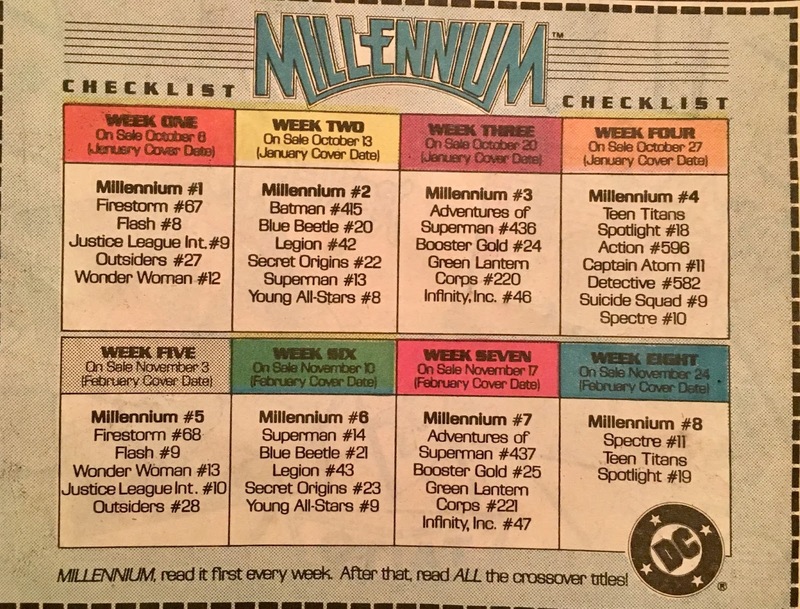 A couple weeks back I came across the pair of Illustrated Indexes for Millennium from Independent Comics Group. 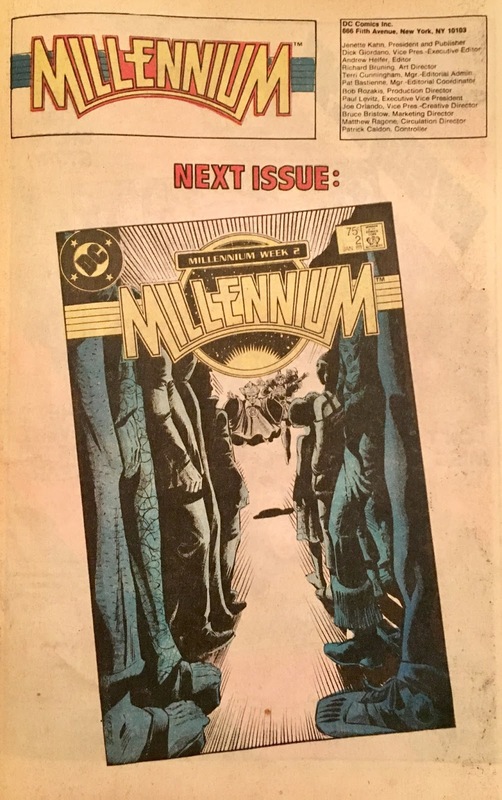 Flipping through 'em made me really wanna give this a reread... and perhaps even set-up a discussion for either The Cosmic Treadmill or Weird Comics History. Fast forward another week... and I find the DC Focus issue that is focusing on this very same event! I figure the universe has gotta be trying to send me a message, right? Either that, or I'm about to find out my wife is really a Manhunter... or maybe it's one of the dogs! 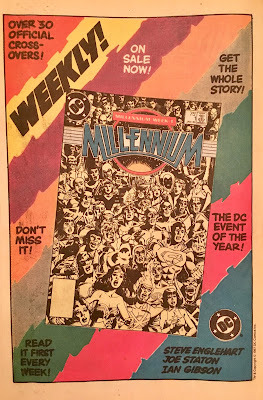 Anyhoo... let's take a look at the first issue of this late-80's DC Comics event! We open on... an ordinary day in the DC Universe. The Justice League is doing their thing, people are living their lives... everything's cool. Well, perhaps not... because there is a spot in Manhattan Beach where a group of not-so-ordinary citizens have assembled. 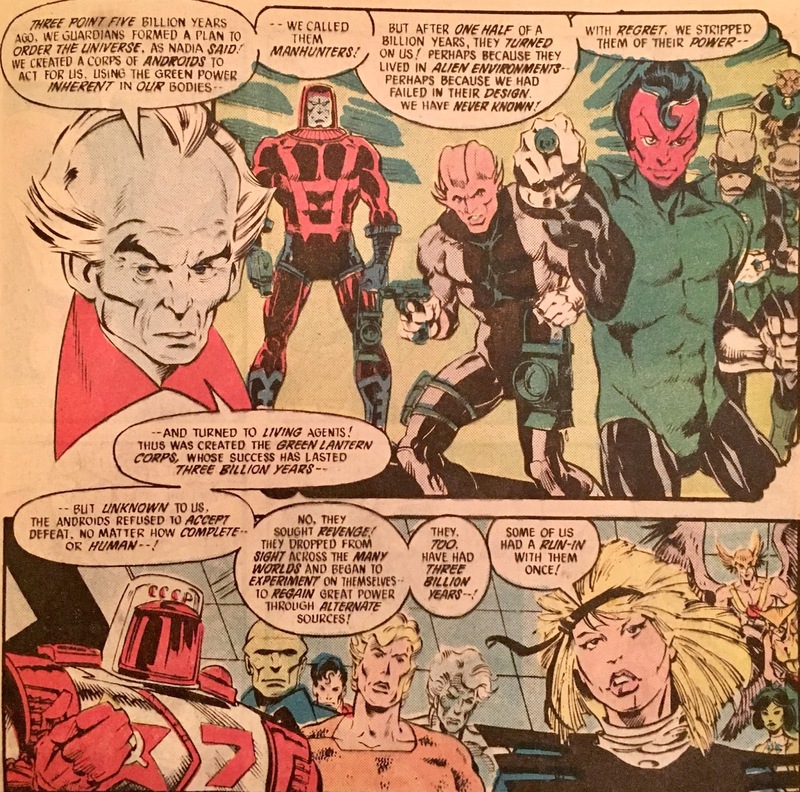 Ya see, these are the Manhunters... and some of them might be pretty familiar to we DC Comics faithful. They have come together in order to receive an audience with the Grandmaster... who looks a bit like he'd missed the bus back to Asgard. He instructs them that their time as "sleeper agents" is about to come to an end... and it's just about time for their murderous intentions to come to fruition. Of particular note, Green Lantern's pal, Tom Kalamaku (who we might know better as, ahem... Pieface) is watching this whole presentation from a window. Before he knows it, Tom finds himself surrounded by Manhunters... and they proceed to beat the holy hell out of him. 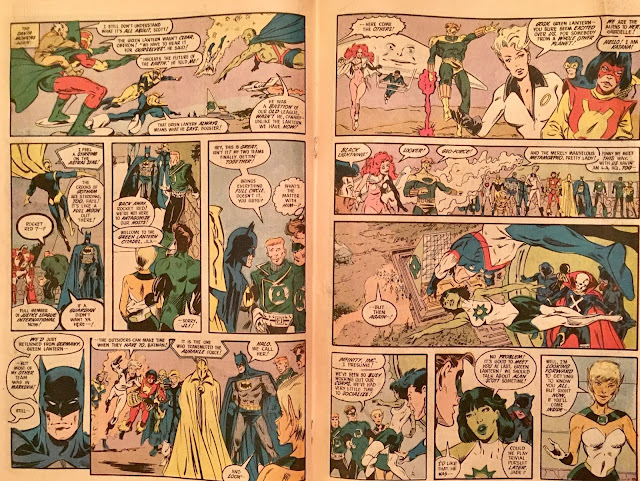 We shift scenes to the Santa Monica Mountains where what's left of the Green Lantern Corps now keeps their citadel. They're all having fun out by the pool... trying to keep things light for Kilowog, who has just found out that his people are really and truly gone. Their day is soon interrupted by the arrival of a Guardian and a Zamoran! Ain't that always the way? 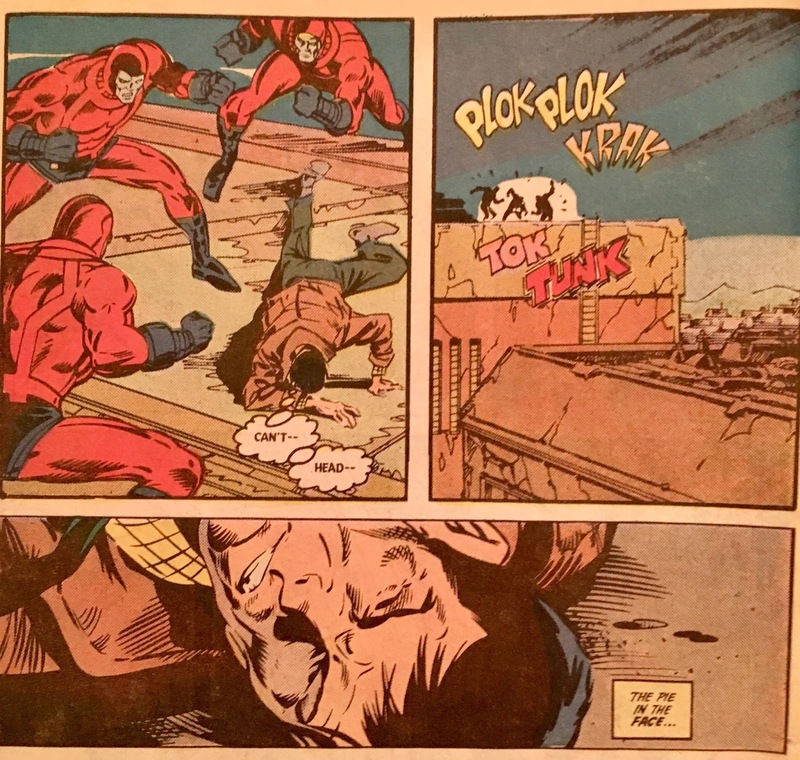 The Old-Timer ruins an otherwise nice day by sharing the news of the Manhunters. We shift back to Tom, who is now laid out on an airport runway directly in the path of a landing 747. 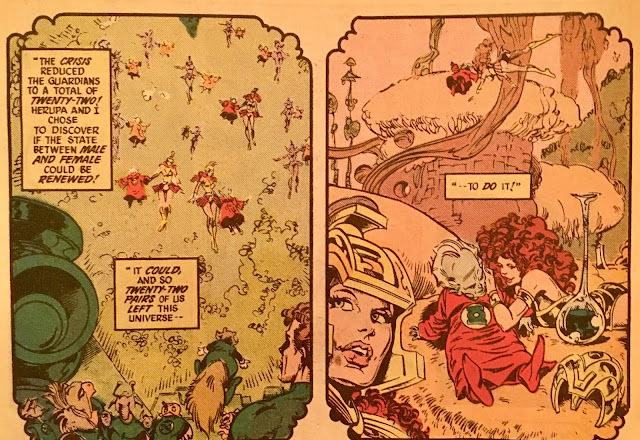 The art isn't entirely clear whether or not Tom was intended to survive this... we'll just play it safe and assume he did. 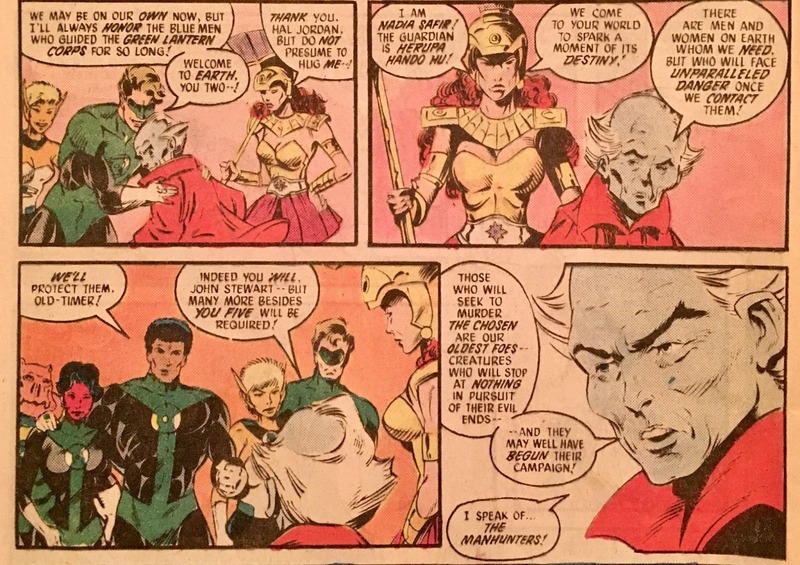 We next go to a brief scene featuring Harbinger. You remember her, right? She is the blonde who was always hanging around the Monitor around Crisis-time. Anyhoo, she appears to remember the events of the Crisis, is now tasked with researching the new histories of the new Earth's heroes. 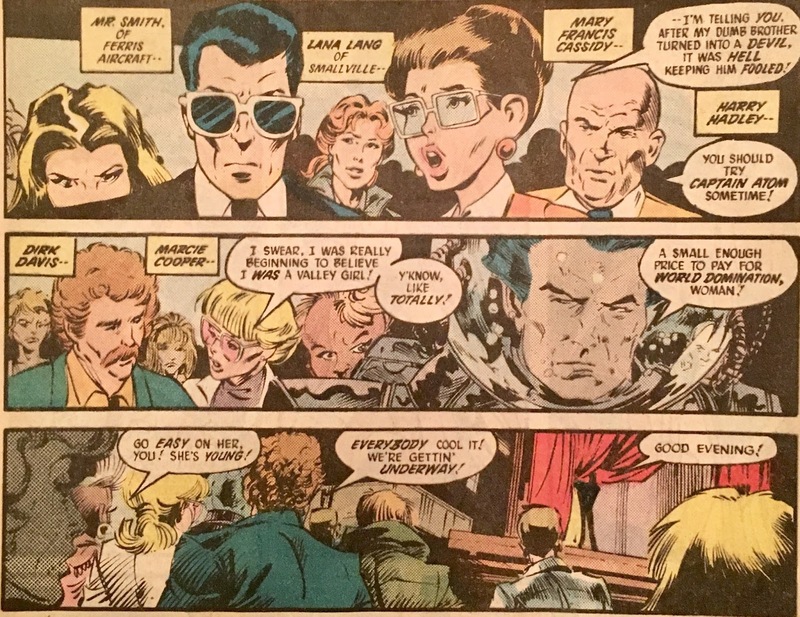 If we can't even keep 'em straight in the comics, what hope does this poor woman have, right? 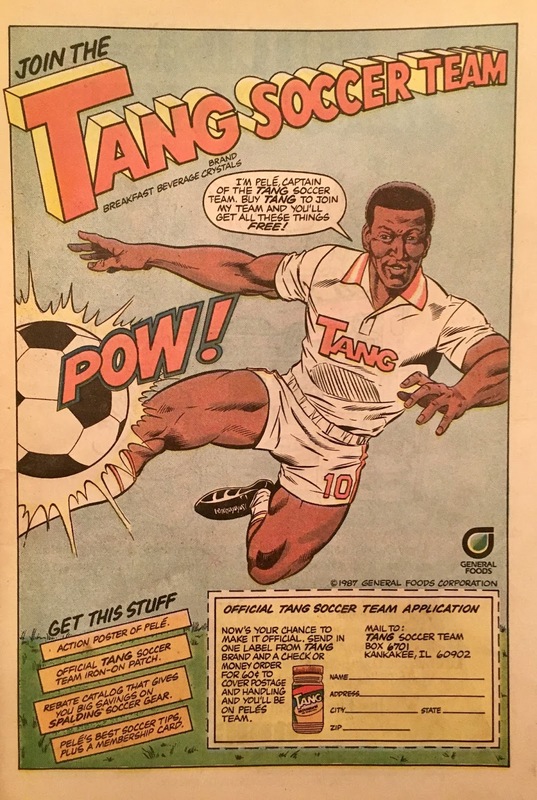 Back in Santa Monica, many heroes have answered Hal Jordan's call to arms... even though we never saw him make that call. Not gonna worry about that. Anyhoo, scenes like this are really cool... especially during this vintage. This was before big events and universal team-ups were "Tuesday" in our respective comics universes... this was truly something of a novelty. 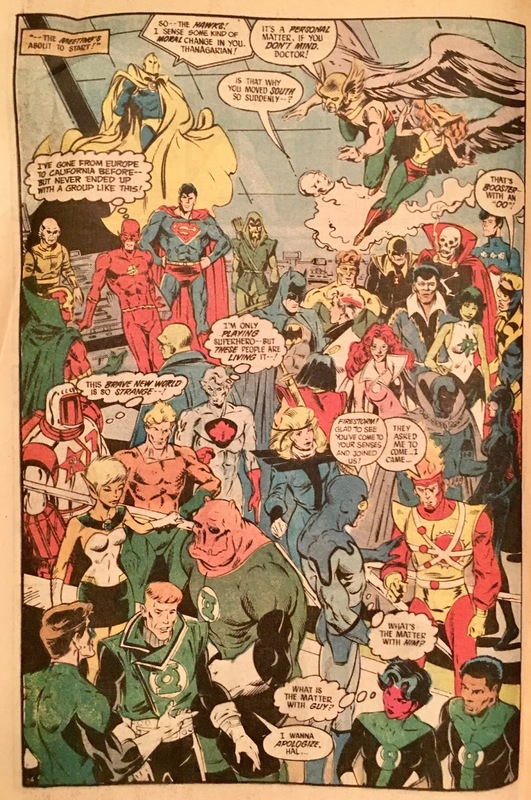 Among the teams that arrive are the Justice League International, the Outsiders, and Infinity, Inc. Of note, Kilowog ain't too keen on seeing a Rocket Red. Still some bad blood, I guess! And they become better acquainted inside the citadel. By now Superman, Green Arrow, Aquaman, and Firestorm have also arrived. Of note, Guy Gardner is acting a bit strange. 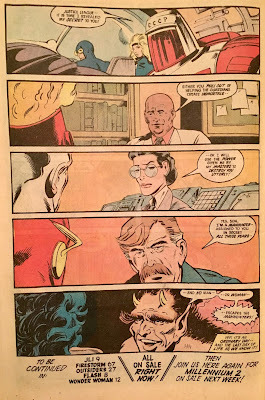 This is due to this story occurring during that time early in Justice League International, where he bonked his head and started acting like a sweetheart. After the meet and greet, the Old-Timer and Nadia Safir of Zamoran share their secret origins with the group. Their respective races both hail from Maltus (five billion years ago). They are immortal, and as such, put little thought into the need to procreate. I mean, forever's a long time, I guess? Well, after the Crisis, their numbers were cut down to a mere 22 apiece. Time to get busy! The Old-Timer continues. He refers to the present time as "The Millennium", and they have chosen to come to Earth to take the ten humans they had chosen and transform them into immortals. Only problem being... the Manhunters would prefer this not happen... and hope to murder the chosen before their transformation could occur. The heroes don't appear to be buying what the Oans are selling... and even question the wisdom of choosing Earth. J'onn asks "why not Mars"... Mister Miracle's all "there's a perfectly fine New Genesis right over thattaway?". It seems like the whole plan is coming apart. 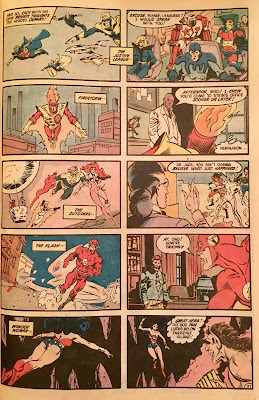 Of interest, Flash asks why the Teen Titans aren't present... to which, the Old-Timer informs him that one of "The Ten" is actually a member of the Teen Titans! Yessiree, Terra is gonna be an immortal! Oh, waitasec, she's already dead. Gotta say, the Oans are batting a thousand at this point! 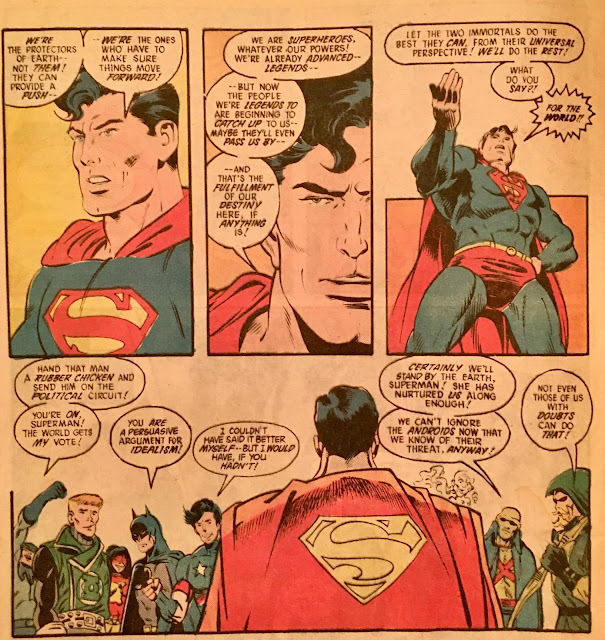 Before the natives can grow even more restless... Superman speaks up. He gives an impassioned speech, discussing their responsibility to act as the legends they are seen as... and so, the heroes are won over. 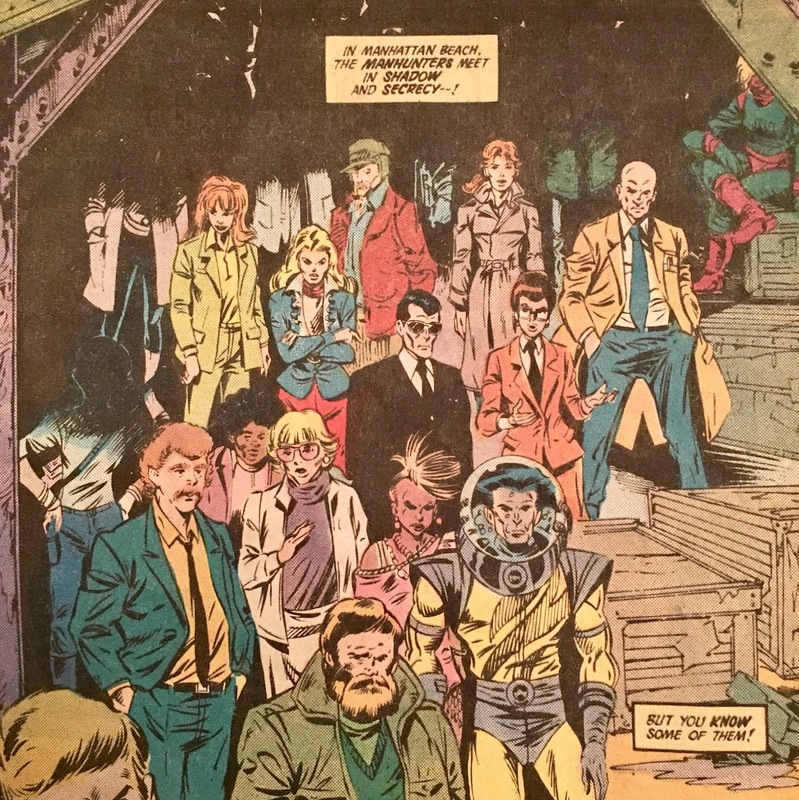 We wrap up this opening chapter with several heroes heading home... where they come to learn that folks near and dear to them, are in fact... Manhunters! I know this event gets a bit of flack... and I think much of that is apt. It's been... at least a decade since the last time I've read this. The only Manhunter reveal I can even recall off the top of my head is Lana Lang (and if I'm not mistaken, like EVERY kid in Smallville? ), just due to the sheer ridiculousness of it. 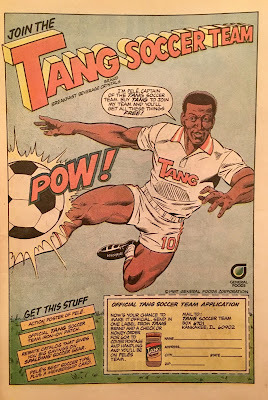 That having been said, this was a good issue... and decent introduction to the concept. 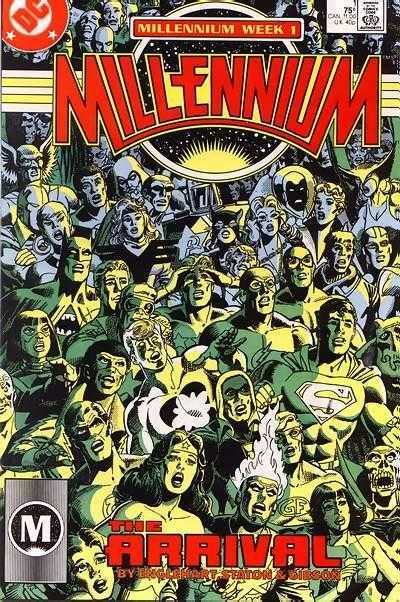 It's being built sort of like a horror movie... which would also be done 20 years later at Marvel with Secret Invasion. The idea that the person right next to you could be one of "them", is an old horror trope... but it still works. Before discussing some of the reveals... let's talk about some story bits. Like I said above, the various heroes all assembling was a great scene. I'm always a fan of these get-togethers, especially when they happen sparingly. It seems these days we don't go a month without teams meeting up (it's often weekly if we're talking about Marvel)... so, to see this was really fun. I could have stared at the meet-and-greet pages for hours... okay, minutes... but you get the point. Let's list some of the reveals. Early on we see Mr. Smith (from Ferris Aircraft), Lana Lang (duh), Mary Frances Cassidy (Blue Devil's sister), Harry Hadley (from the Captain Atom Project), Dirk Davis (Booster Gold's manager), and Marcie Cooper (granddaughter of the original Manhunter). We get a little bit of everything in this group... and it's pretty neat. I still think turning Lana was a dumb move, but the others are close enough with the heroes to make the swerve matter, while not completely upsetting any apple carts. 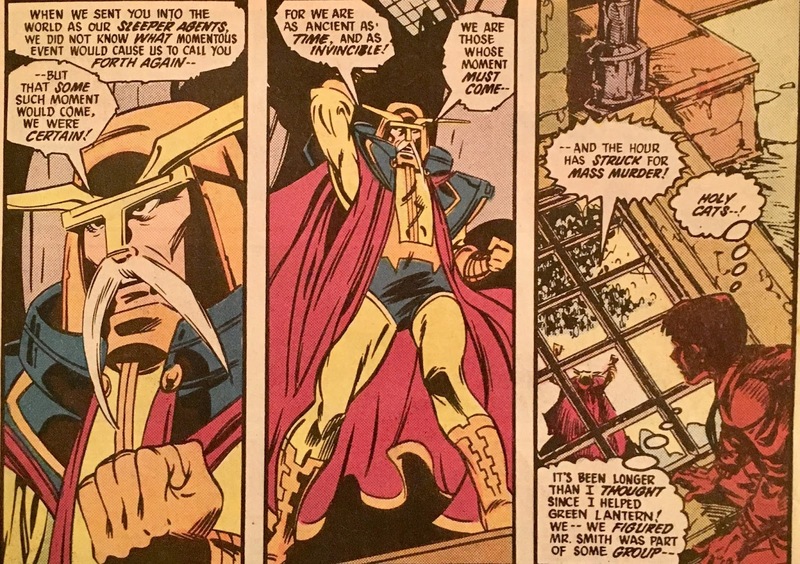 Oh, and I'll say again here... the Grandmaster looks like an idiot. Really anachronistic design... looks very out of place. At the end of the book it's revealed that Rocket Red #7 (from the JLI), Chief Ferguson (Firestorm's police contact), Dr. Jace (who's been hanging with the Outsiders), Rudolf West (Wally West's father), and the Olympian God, Pan. Again, some good choices... with a couple of potential "shocks". Dr. Jace had become quite the mainstay in Batman and the Outsiders... so that's an interesting one. Of course, Wally West's father being outed is a bit crazy... I'd totally spaced that! Rocket Reds are pretty interchangeable in my opinion... so if you had to make a JLIer a Manhunter... that choice was as good as any! I appreciated the heroes being somewhat skeptical of the Guardian's tale. I was actually a bit surprised by how willing Hal was to "do business" with the blue guy. I'd think they'd be at least a bit standoffish... or that the Old-Timer would really have to "sell" Hal on the idea before he calls everyone in the DC superhero phone book. I think the best part of the heroes being unsure was that it led to Superman rallying the group. That's what Superman is to me... he is the one the heroes will always stand behind. He is the best of them, and the rest respect him so much that they will follow. 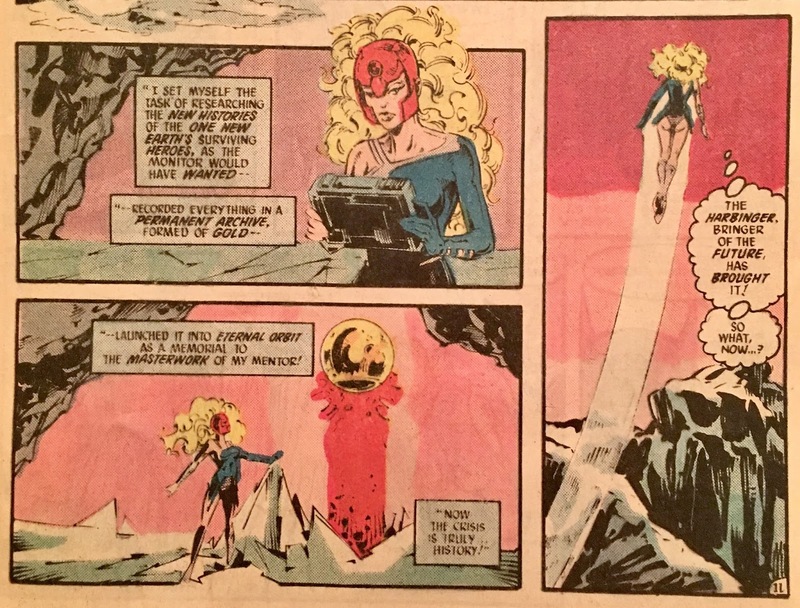 The art throughout this issue was a bit uneven. There were certain pages that just popped, while others looked somewhat rushed... or maybe just less detailed. Overall though, I thought it looked fine.